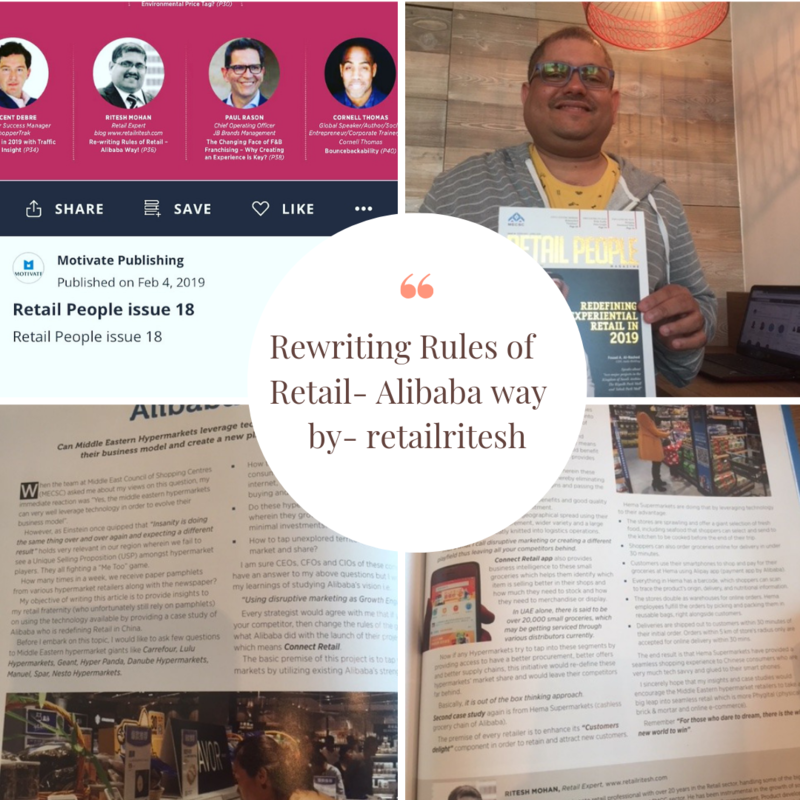 09 Feb Re-writing the rules of Retail….Alibaba way!! In my previous article, I had written about re-writing rules of retail i.e. Retail 3.0, in continuation to the same article, let me present you the case study of Alibaba.com, who has already actioned the same and milking its advantages. When the team at the Middle East Council of shopping centers (MECSC) asked me about my views on this question. My immediate reply was “Yes”. However, as Einstein once quipped that “Insanity is doing the same thing over and over again and expecting a different result” holds very relevant in our region wherein we fail to see a Unique Selling Proposition (USP) amongst hypermarket players. They all are fighting a “Me Too” game. How many times in a week, we receive paper pamphlets from various hypermarket retailers along with the newspaper? My objective of writing this article is to provide insights to my retail fraternity (who unfortunately still rely on pamphlets) on using the technology available by providing a case study of Alibaba who is redefining Retail in China. a) How they intend to differentiate their offerings to consumers who are very well connected through the internet, who prefers researching their purchases prior to buying & convenience of shopping? b) Have hypermarkets ever thought of business model wherein they grow their scale of operations 10X (10 times) with minimal investments? c) How to tap unexplored territories to grow their sales & market share? I am sure CEOs, CFOs and CIOs of these companies must have an answer to my above questions but I would like to share my learnings of studying Alibaba’s vision i.e. “Using disruptive marketing as Growth Engine”. Every strategist would agree with me that if you cannot defeat your competitor, then change the rules of the game and that’s what Alibaba did with the launch of their project i.e. Ling Shou Tong which means Connect Retail. The basic premise of this project is to tap unexplored markets by utilizing existing Alibaba’s strengths i.e. robust supply chain, a wide array of products & vast suppliers base, efficient delivery & order processing, order fulfillment & logistics support. Alibaba, in order to bring efficiencies into their existing businesses and using their existing strengths, has ventured into territory which has been untapped so far by the launch of Project Connect Retail. They have adopted 100,000 small grocery stores and connected them with their integrated POS system by means of the app. The result is that these small grocery owners could benefit from buying directly from Alibaba suppliers which provides Low Prices Everyday brand promise. This project has created a Retail ecosystem wherein these small groceries procure directly from Alibaba thereby eliminating distributors and improving their buying margins and passing the cost benefits to end customers. Customers stand to gain from price benefits and good quality products backed by Alibaba’s commitment. In return, Alibaba gains wider geographical spread using their core strengths i.e. procurement, wider varieties, a large base of suppliers- all neatly knitted into logistics operations. That’s what I call disruptive marketing or creating a different playfield thus leaving all your competitors behind. Connect retail app provides Business Intelligence to these small groceries i.e. as to which item is selling better in their shops and how much they need to stock and how they need to merchandise or display. In UAE alone, there is said to be over 20,000 small groceries, which may be getting serviced through various distributors currently. Now if any Hypermarkets try to tap into these segments by providing access to their better procurement, better offers and better supply chains, this initiative would re-define these hypermarket’s market share and would leave their competitors far behind. Basically, it is out of the box thinking approach. Again is from Hema supermarkets (cashless grocery chain of Alibaba). Foremost priority of every retailer is to enhance its “Customer delight” component in order to retain and attract new customers. Hema supermarkets are just doing that by leveraging technology to their advantage. The stores offer a giant selection of fresh food, that shoppers can select and send to the kitchen to be cooked before the end of their trip. Shoppers can order groceries online with 30 mins delivery guaranteed. Everything in Hema has a barcode, which shoppers can scan to trace the product’s origin, delivery, and nutritional information. Deliveries are shipped out to customers within 30 minutes of their initial order. Orders within 5 km of the store’s radius only are accepted for online delivery within 30 mins. The end result is that Hema supermarkets have provided a seamless shopping experience to Chinese consumers who are very much tech savvy & glued to their smartphones. I sincerely hope that my insights and case studies would encourage the Middle Eastern hypermarket retailers to take a big leap into seamless retail which is more Phygital (physical brick & mortar and online e-commerce). “For those who dare to dream, there is the whole new world to win”. Reference: My article published in “Retail People” magazine. Ritesh Mohan is a passionate retail professional with over 20 years in the Retail sector, handling some of the biggest brands in beauty, fashion and fragrances retail & FMCG sector. Ritesh has been instrumental in the growth of some of the regional brands as well in the Middle East region. His specialization includes Retail management, Product development, and Brand Management, Retail Operations, Sales Management, and Franchising management. He strongly believes in empowering business owners with his wisdom & experience of around two decades in the industry.